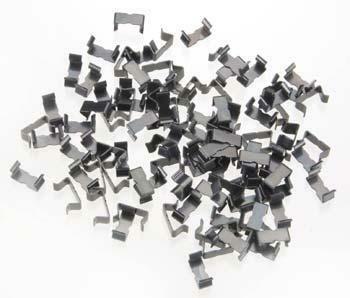 This is the AFX Slot Car 100 Pack Track Clips from Tomy. Suitable for Ages 8 & Older. Retail $48.98 SAVE 35% ! Press into place with your thumb and remove with a small screwdriver Clips are out of sight and don't cause "teeter tottering" on hard surfaces High quality stainless spring steel Completely closes gap in between track pieces Two clips are used for each piece of track junction. "TIGHT connections make for smooth running and consistent power!" Installation of these clips is done on the back side of the joint and makes for VERY tight joints that really help to improve both the electrical connection - but also the smoothness of the joint - something that is really noticeable if you are running non-magnetic (old Aurora T-jets) or lower magnetic down force cars like AutoWorld X-Traction / Thunderjet cars. I found the biggest improvement and ease of use being to do a corner section and one piece of straight track in both directions from the corner. This keeps the clipped together sections reasonable in size, allowing for manageable flipping over after installing the clips. Great to see these tight fitting spring clips being available again!